In recent years the venerable topic of thermal (diffusion) waves [Ångström, 1862] has received increased attention [Mandelis, 2000], primarily in the context of modern methodologies for diagnosing the properties of condensed and gaseous matter. Advances in experimental techniques and in the understanding of the mathematical properties of diffusion equations driven by sinusoidally, time-varying sources have resulted in the concept of thermal-wave resonators [Shen and Mandelis, 1995]. The frequency dependence of driven resonators is currently used to measure the properties of liquids [Balderas-Lóex et al., 2000], gases [Bertolotti et al., 1998] and liquid-gas mixtures [Azmi et al., 2005]. Although thermal waves have not been as extensively studied in the plasma state [Gentle, 1988; Jacchia et al., 1991], some of their features have been effectively used to deduce subtle issues of the anomalous cross-field transport in tokamak devices [Mantica et al., 2006; Casati et al., 2007]. A complexity of thermal waves in magnetized plasmas is that the thermal conductivity along the magnetic field, κ||, is several orders of magnitude larger than across, κ⊥. In addition, the numerical value of κ|| can be quite large. This makes the study of thermal waves in plasmas considerably more difficult than in the undergraduate “Angstrom modulation” experiment [Bryant, 1963]. The plasma systems must accommodate a long, and spatially isolated, heated region whose length along the magnetic field is much larger than the cross-field dimension. The configuration of this thesis experiment provides an environment akin to the thermal-resonators developed for other states of matter, but, in addition, the free energy available is found to spontaneously generate a highly-coherent thermal resonant cavity mode. A coherent mode of frequency lower than the drift-Alfvén mode frequency has been observed in previous work within this geometry, see Section IV of Burke et al. [2000a]. The identification of this mode as a thermal wave is presented in this Chapter. Figure 3.1: Power spectrum of electron temperature measurements averaged over the entire heating period and all shots acquired at the filament center. The axial position is z = 384 cm. 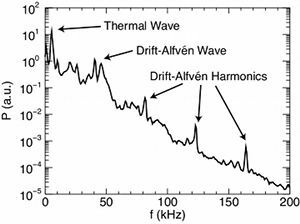 The thermal wave is the largest amplitude oscillation, though some power from the drift-Alfvén mode and its harmonics is present. Figure 3.1 is a power spectrum averaged over the entire heating period of all of the shots acquired in the center of the filament. One of these shots was previously plotted in Fig. 2.13. From the power spectrum it is possible to identify multiple distinct modes. The broad peak just below 50 kHz represents the drift-Alfvén mode (an m = 1 eigenmode as shown in Fig. 2.14b). In this case, the peak is broadened due to the time averaging of the spectral analysis across the frequency evolution of the mode. Several harmonics of this wave are also identified in the plot. The thermal wave peak is identified near f = 5 kHz. Figure 3.2 illustrates the nature of the temperature fluctuations that correspond to the thermal wave. Coherent low frequency (< 10 kHz) oscillations are seen from 1 ≤ t ≤ 3 ms in the measured trace. 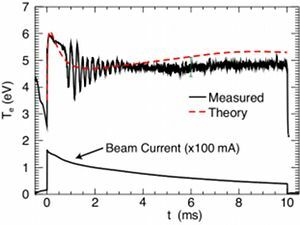 It is important to note that during this time there are no oscillations in the injected current of the electron beam as shown in the bottom trace. The agreement between the mean measured electron temperature and that of the theoretical model shows that heat transport remains classical during observations of the thermal wave that occur early in the filament evolution. Figure 3.2: The top traces are the measured (solid black) and theoretical (dashed red) results for the electron temperature at an axial distance of z = 224 cm at the center of the filament. An error bar (solid dark green) is placed at t = 6 ms and represents the typical error across all the measurements. No oscillations are included in the theory trace, which represents classical heat transport. The bottom trace is the injected current of the electron beam. 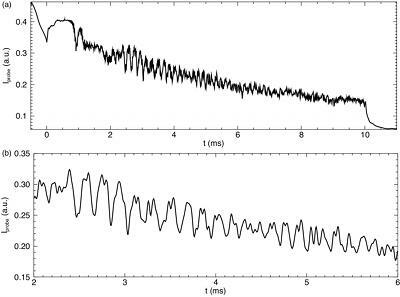 Figure 3.3 shows thermal wave oscillations observed well beyond the t = 3 ms point of Fig. 3.2. The current collected by the probe, Iprobe, is plotted for the fixed probe bias value of Vprobe ≈ -40 V. The amplitude of the low frequency mode decreases in time, but is still visible beyond the 4 ms mark. The decay of this trace is once again due to the background density decay of the afterglow plasma. Panel (a) presents the entire time series while panel (b) is a zoomed in view highlighting the oscillations within the 2 ≤ t ≤ 6 ms range. The data has also been digitally low-pass filtered at 20 kHz for the presentation in (b). Figure 3.3: Time series of current collected by the biased probe for a fixed value of the bias. (a) Full time series without filtering. (b) Narrow time series that has been low-pass filtered at 20 kHz and then minimally smoothed for plotting. Thermal waves were first detailed by Ångström over one hundred years ago [Ångström, 1862]. Ångström solved the equations for diffusive heat transport in scalar media and obtained the dispersion relation of the thermal wave, the propagation of heat fronts through materials. They are studied in undergraduate physics labs [Bryant, 1963]. Students apply and remove a heat source (blow torch) to one end of a metallic rod and then record the temperature along the rod as a function of time. The period and wavelength calculated from these measurements allow for the determination of the thermal conductivity of the metal. Advanced applications of this method allow for the measurement of material properties in liquids [Balderas-López et al., 2000], gases [Bertolotti et al., 1998] and liquid-gas mixtures [Azmi et al., 2005]. A similar result is obtained for the plasma experiment and motivates the design of diagnostics that utilize thermal wave properties to measure plasma thermal conductivities. The dispersion relation of a thermal wave in a magnetized plasma is more involved than that of other media because the confining magnetic field breaks spatial symmetry. Furthermore, the thermal conductivity of the plasma parallel to the magnetic field, κ||, is orders of magnitude larger than that across the field, κ⊥, which constrains the experimental geometry capable of studying these waves. The large difference in thermal conductivities requires that the plasma device be capable of containing a plasma structure that is approximately 900 times longer along the magnetic field than it is across. The heated filament in this experiment can serve as a resonant cavity for the thermal wave due to its extended axial geometry and the sharp boundaries resulting from the difference in thermal conductivity between the heated filamentary plasma and the cold background plasma. In Eq. (3.3), me is the mass of an electron, ωce is the electron cyclotron frequency, and τe is the electron collision period. The electron collision period is given by τe = 3.44 × 105 Te^(3/2)/(nλ), where λ is the Coulomb logarithm. These relations allow for the calculation of the electron collision frequency of the plasma to be calculated from the measured wave numbers of the thermal wave. The finite length of the temperature filament, coupled with the high parallel thermal conductivity of the plasma, results in an environment akin to the thermal wave resonators mentioned in the beginning of this Chapter. As such, it is possible to leverage the properties of the thermal wave resonator to further study the filament. One particular advantage of this situation is that the quarter-wavelength cavity condition provides a new avenue through which to study the axial length of the filament. Figure 3.4: Axial dependence of Te (solid black) compared to predictions of the cavity length necessary to sustain the thermal wave as a resonant mode. The code phase (solid blue) is taken from the model of a thermal wave with f = 5.1 kHz. 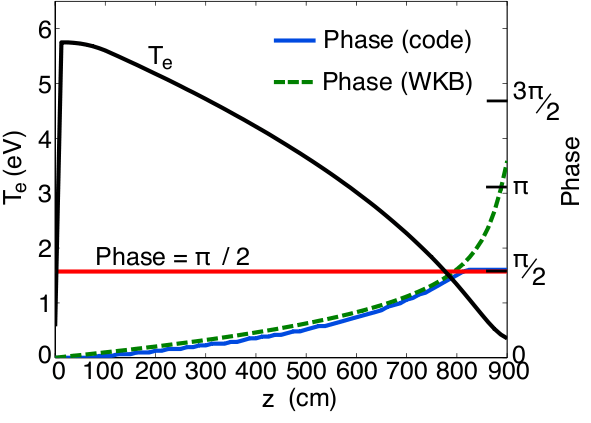 The WKB phase (dashed green) is the Wentzel-Kramers-Brillouin phase determined from (3.2). The horizontal (solid red) line represents a phase value of π2 and its intersection with the other curves is the length at which the quarter-wavelength resonance condition is met. Theoretical work regarding the axial properties of this system indicates that the quarter-wavelength condition is met [Shi, 2008]. 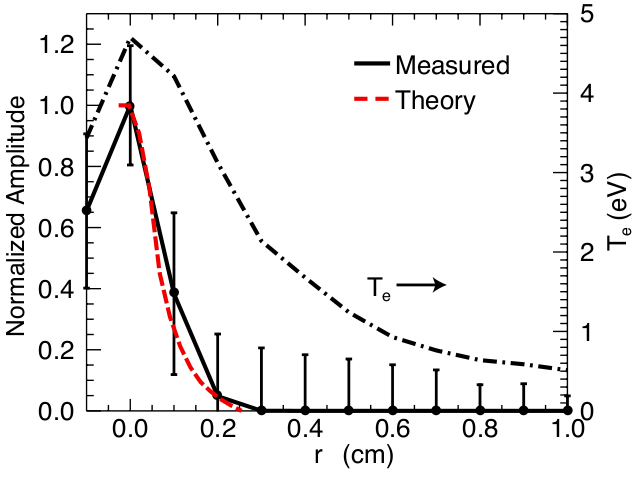 Figure 3.4 compares the axial temperature profile from the model with the theoretical phase results. The condition of phase θ = π/2 corresponds to the quarter-wavelength cavity length. Axial temperature profiles are taken from the model because time constraints in experimental runs prevent a detailed measurement. The model is known to be accurate during the regime of classical transport, so its usage is warranted in this situation. Figure 3.4 shows that the cavity condition is met for a filament length of less than nine meters. Such a length is in agreement with exploratory measurements taken during the setup of experiments. More importantly, this length fits within the LAPD-U. Equation (3.4) is solved using the measured plasma parameters to calculate κ||. The result is L = 940 cm, in agreement with the result of Fig. 3.4. Some discrepancy between the values is expected since the background plasma density decays during the experiment and causes the temperature filament to evolve in size. The thermal wave frequency evolves in time, a result that is shown in Fig. 3.5. Figure 3.5: Zoomed in view of oscillations due to the thermal wave as shown in Fig. 3.2. The measured (solid black) result shows a frequency change over time as the phase is observed to deviate from the fixed frequency wave utilized in the model (dashed red). The changing thermal wave frequency is illustrated by Fig. 3.5. The figure presents a close-up view of the coherent oscillations visible in Fig. 3.2. 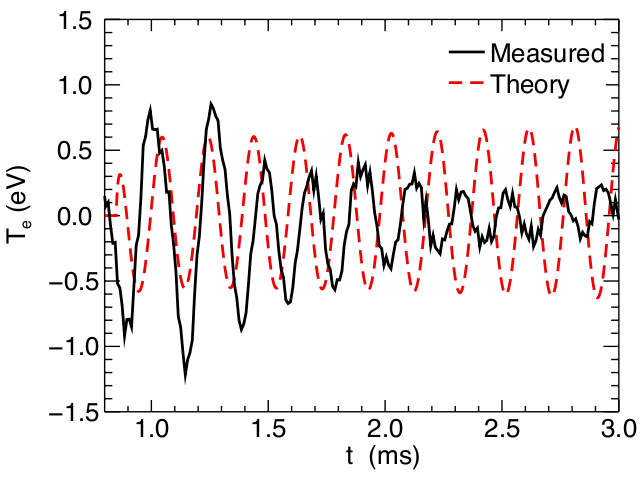 The measured trace (solid black) exhibits a slippage in phase difference compared to a fixed frequency model (dashed red). In this instance, the model is a simple, sinusoidal temperature oscillation source (Qb ∝ sin(ωt) in Eq. (2.6)), i.e., it is not self-consistent and cannot predict a spontaneous wave. As mentioned previously, there is a constant decay in the background plasma density that is part of the normal evolution of the LAPD-U afterglow. Manual determination of the frequency (measuring the period of individual oscillations) shows that the highest value of 5.2 kHz occurs early in the signal and then the frequency decreases until it reaches 3.9 kHz. From the inversely proportional relationship between thermal wave frequency and the filament length given in (3.4), the behavior in Fig. 3.5 suggests that the filament length increases as time progresses. represent the imaginary and real parts of their arguments, respectively. The imaginary part of the perpendicular wave number is calculated using the measured radial decay length. The real part of the parallel wave number is calculated from the measured parallel phase velocity. The electron gyrofrequency is set by the applied magnetic field, leaving the electron collision time as the only undetermined variable. Figure 3.6: Top curve (dash-dot black) is a radial profile of the electron temperature at axial position z = 544 cm. The other curves represent the radial extent of the thermal wave fluctuations. The normalized amplitude of Te fluctuations (solid black) at z = 544 cm is the integrated value over the frequency range f = 3.7 – 6 kHz. The theoretical result (dashed red) is the amplitude as generated by the theoretical model. Figure 3.6 plots the radial profiles of the filament temperature and the amplitude of the thermal wave fluctuations. The amplitude is calculated by integrating the power in the Te time signal over the frequency range f = 3.7 – 6 kHz. The thermal wave is contained within a narrow region of the filament and its measured radial decay length is δr = 1 mm. Since the diameter of the probe is also 1 mm, this can be considered to be the smallest possible decay length that can be measured. Useful information is obtained because the theoretical model (dashed red curve in Fig. 3.6) predicts a decay length of δth = 0.9 mm and the measurement confirms the actual decay length cannot be much larger that prediction. The upper bound provided by the measurement of the decay rate translates into a lower bound for the imaginary part of the perpendicular wave number. The real part of the parallel wave number is related to the parallel phase velocity, v||, through the expression ω / k|| = v||. The angular frequency is known from the time series. The power spectrum of the Te signal peaks at f = 5.1 kHz in this case. Parallel phase velocity is measured using a cross-spectral technique. Two probes are placed axially apart a distance of Δ z = 384 cm. One probe is fixed at r ≈ 0.15 cm to ensure that it observes low frequency oscillations due to the thermal wave. This probe cannot be placed at the direct center of the filament because it will perturb the system and reduce the accuracy of the measurement. When placed at the center of the filament, even a small probe tip may serve as a physical barrier that sets the axial length of the filament. Since the filament acts as a resonant cavity for the thermal wave, forcibly altering its dimensions will either change or eliminate the wave. The second probe acquires data at every point throughout a two-dimensional plane. The cross-phase, Θ, between these signals is calculated for the thermal wave frequency [Bendat and Piersol, 2000] when the second probe is positioned at the center. From the cross-phase the time delay between the signals, Δt, is given by Δ t = Θ / 2πf. This time delay, coupled with the distance between the probes allows for the calculation of the parallel phase velocity, v|| = Δz / Δt. The measured phase velocity is v|| = 1.9 × 107 cm/s. Comparison with the result from the theoretical model, v||,th = 2.2 × 107 cm/s shows excellent agreement. Equation (3.5) can now be solved for the electron collision time. The result is τe = 5.93 × 10-7 s. Using standard parameters of the filamentary plasma (Te = 5 eV, n = 1012 cm-3, λ = 10) leads to a value of τe = 3.87 × 10-7 s. The values are comparable and suggest that a diagnostic based on driven thermal wave oscillations can provide a measurement of electron collision frequency. Thermal waves are commonly studied in non-plasma states of matter. Driven thermal waves allow for the precise calculation of the thermal conductivity of a material. Magnetized plasmas are a more difficult medium in which to observe these waves due to the large difference in thermal conductivity along the magnetic field compared to that across it. The extended geometry of the temperature filament provides an excellent environment for studying these waves because it develops into a resonance cavity in which a thermal wave is spontaneously generated. Throughout the experiments performed with the filamentary geometry, low-frequency oscillations that do not correspond to drift-Alfvén behavior have been observed. These are oscillations in electron temperature and are not directly driven by similar oscillations in the beam heating. The drive mechanism remains to be determined. Consideration of the resulting wave as part of a thermal wave resonance cavity allows for the calculation of the filament length based on measurements of the wave’s frequency. This result is in agreement with direct measurements near the axial end of the filament. Furthermore, the properties of the thermal wave are set by the thermal conductivity of the plasma. Measurements of the parallel and perpendicular wave vectors provide for an additional calculation of the thermal conductivity, which is presented here as the calculated electron collision period. These large amplitude fluctuations of the thermal wave modulate the drift-Alfvén eigenmodes that are generated by the pressure gradient of the filament. It is useful to study the behavior of the thermal wave in order to determine its complete role in the turbulence resulting from drift-Alfvén interactions, which is the subject of the following Chapter. December 15, 2009 in Physics.